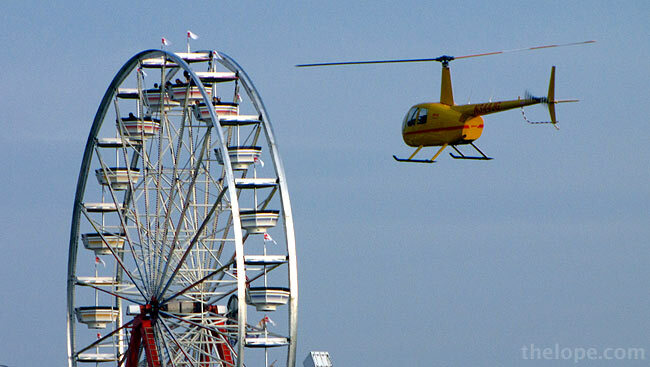 Schreib-Air of Augusta, Kansas, sells five-minute helicopter rides at the 2009 Kansas State Fair for $40 - down $5 from last year. I took a ride in this sporty little red one. Photographers should note that this little red one has the doors off and is a two-seater. The other seat is occupied by the pilot, which guarantees you'll not be shooting over any other passengers and you'll have a great view to your left. They generally use larger helicopters like the one above that hold more people; they do not guarantee your position as to seating. Also, the other copters may have doors which can make photography problematic. I was able to get the small, red two-seater because I asked, but mostly because the larger ones were not in service at that particular time. In my experience, their employees were easy to work with. 2:39 to 2:52 - The rather imposing Reno County Courthouse is one of Hutchinson's great Art Deco buildings. 3:08 - The troubled Wiley Building is attached to another of Hutchinson's Art Deco treasures, the fabulous Fox Theatre to its right. 3:22 - The Landmark apartment building - formerly the Stamey Hotel - was built in 1922. 4:22 - This view of Ye Old Mill shows the layout of channels that carry patrons through this 1915 water dark ride.